Training Camp is almost here! Less than a month. Who will make the team, practice squad or get cut? Well time will tell, but I will give you my predictions for those 3 questions. I will go by making a list of who I think will make the team and on to the next. Lane will not beat out Iosefa for the Fullback job because Lane is coming off a gruesome leg injury and Iosefa is young and can do as good of a job. Myers will beat out Stocker because Myers can help the team in the blocking and receiving department, which Stocker really never lived up to his 4th round title. Koenen has been a bust of a signing in Tampa and its time for a change at the punter position. Orie Lemon, who looked good in his limited snaps last season produced well and he will out work Jason Williams and Khaseem Greene for the last linebacker’s spot. King has had a good OTA so far, but the Bucs are huge on Robert Herron who is younger and has lots of potential to be a good slot receiver in the league. Leonard will get beat out by Frey who is much better than Johnson and can do a better job in the nickel, who ever wins will backup Sterling Moore. Bucs will most likely go with 2 QB’S on the active roster and use Shepard as a emergency 3rd string with Lobato on the practice squad. The Bucs will keep 4 RB’s like last year and not carry one on the practice squad due to the 4 or 5 running backs they have on the roster. They all bring different styles to the game and it is a key need to have. Can’t have enough running backs. The defensive line and offensive line will each have 9 big men due to their versatility. No kickers or punters on the practice squad because they can replace them easily and not have them take up a spot for a player they like on the practice squad. Doug hasn’t produced over a 1000 yards since his rookie year and has been hurt the past 2 years. So, Doug is due for a huge year. ASJ was hurt most of his rookie year and couldn’t really show the Bucs what he can do, but with gunslinger Jameis Winston in town, the Bucs can count on ASJ pulling in 40 catches for over 500 yards with a number of 9 tds. George Johnson was a solid backup in Detroit, but he will build off his success and now given a full time starting gig, George can get 10 sacks with the help of McCoy. Banks was very good last year and its just the start of Banks reaching his potential and achieving more pass deflections and ints for years to come. He is the Bucs best cornerback. Verner had a up and down year in the Tampa 2, but look for the vet to comeback and show Bucs fans why they signed him to that huge deal 2 off-seasons ago. Donovan Smith is on this list because the future pro bowl left tackle will prove he is the man for the job right of the get go of training camp and thru preseason. Smith will have a great rookie year. Mark my words. Spence has been very good for the role he plays, but look out for Spence to get more snaps on passing downs and get to the quarterback with McCoy taking on the double teams. Remember Spence has the best motor on the D line and is the strongest. 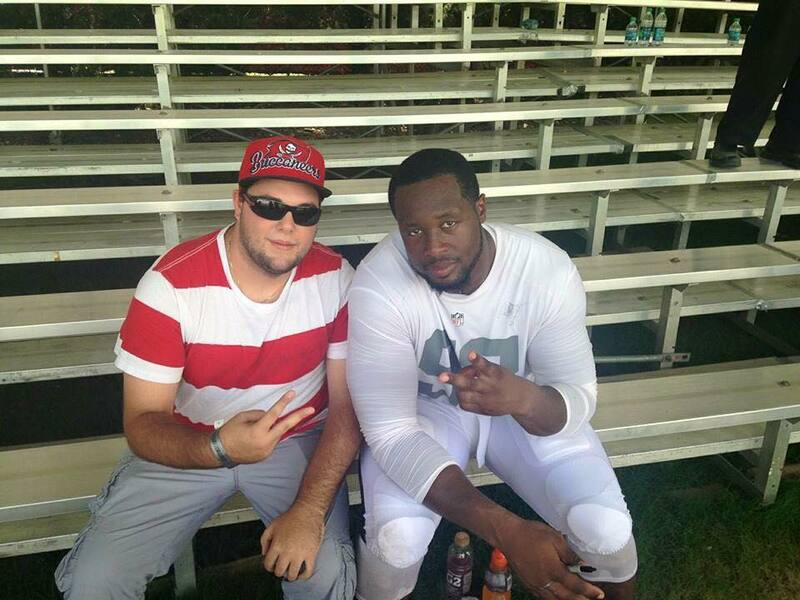 Gerald McCoy and me. Can’t wait for training camp to start and see my Bucs get back to work and then lead the ship back to the playoffs. Fire the cannons and protect the ship and its a Bucs life for me! Next Post Lebron James To Stay In Cleveland!